Branding, invitations, flyers, posters, transit advertising, direct marketing materials, advertisements and printed programs are a few ways Cardinal Graphic Design will help you create a very successful event. Up front quotes are available. Deadlines are always met, using an event planning timeline. Call 508.951.7495 or send us an email to receive a one hour free event consultation. 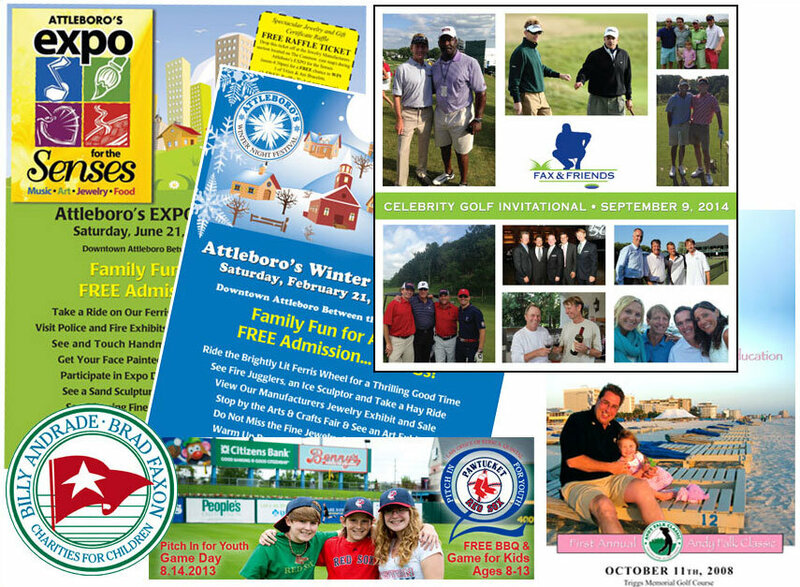 Cardinal Graphic Design plans celebrity golf tournaments for Billy Andrade – Brad Faxon Charities for Children. Over the 20 year relationship we have raised $6,626,049.22 and have dispersed $5,363,030.00 to 205 unique children’s charities in Southeastern Massachusetts and Rhode Island. In 2014, Cardinal Graphic Design planned a brand new Celebrity Tournament for Brad Faxon called Fax & Friends. We dispersed $425,000. to 5 charities: Blessings in a Backpack, Edesia, Folds of Honor, Norman Prince Neuroscience Institute and YearUp. Cardinal Graphic Design is part of a team that founded Attleboro’s Expo for the Senses (2009) and Attleboro’s Winter Night Festival (2010). These events were held annually with our last 10th Anniversary EXPO for the Senses held on August 18, 2018. Each event brought thousands of people to Attleboro’s downtown. Cardinal Graphic Design branded these events and designed promotional materials for print and web marketing. The rest of the team included Mayor Paul Heroux, Nancy Young of Attleboro Jewelers, Mim Fawcett of the Attleboro Arts Museum, and James Jones of DoubleACS.